What is this pack all about? 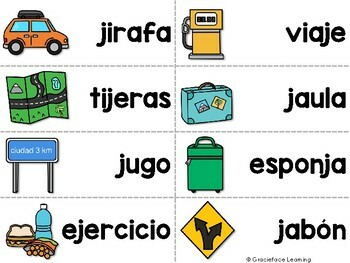 This road trip-themed center will help your students learn all about words with J and G in Spanish. 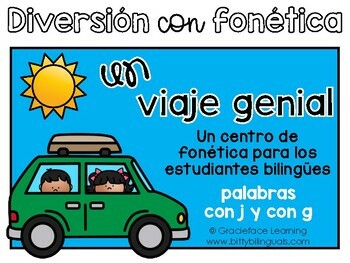 It is a differentiated center so it works for both early primary bilingual students and late primary bilingual students. Please note that the pictures on the cards all go with the theme (road trip) and they do not go along with the word. 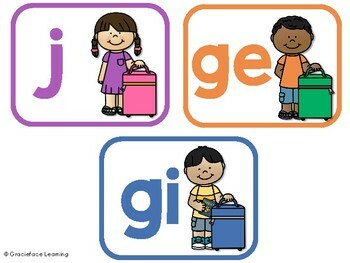 •	5 practice pages to continue learning either through morning work, center work, or homework. Click on the Preview to see all that is included in this pack! I love this product! What else would I like in your store? I love your products! How can I find out about your new products? Thank you! Click on the green star at the top of this page (next to Gracieface Learning). It is that easy! Now you will get alerts about any updates, new products (20% off for the first 48 hours! ), or freebies that I put in my store. How can I earn credits towards FREE products from Teachers Pay Teachers? Please go to your My Purchases page. Beside each purchase you'll see a Provide Feedback button. Simply click it and you will be taken to a page where you can give a quick rating and leave a short comment for the product. Each time you give feedback, TPT gives you feedback credits that you use to lower the cost of your future purchases. Your feedback is super important to me as I use it to help me create other products for your classroom! Where else can I follow you?